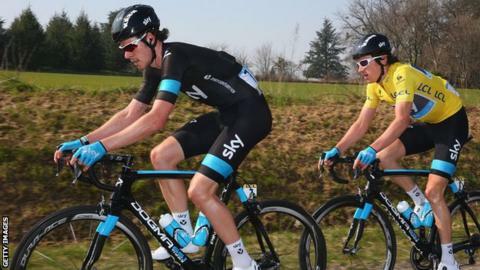 Geraint Thomas can go on to lead a team at the Tour de France, according to his Team Sky team-mate and fellow Welsh cyclist Luke Rowe. Thomas enjoyed a fine season, recording his highest finish in the race, then winning gold and bronze medals at the Commonwealth Games. The 28-year-old has been voted the BBC Cymru Wales Sports Personality 2014 and Rowe believes more success is to come. "I can see him leading a team at a race like the Tour de France," said Rowe. "I think that's what he'd be looking to do in the future." Thomas is currently in Mallorca at a training camp preparing for the start of the new season in January. Sir Bradley Wiggins praised the Welshman's "unselfish" hard work supporting his team when presenting Thomas with the BBC award. Rowe, who cycled together with Thomas at the same club from a young age, believes his friend should become more selfish in future. "I think he's conquered the art of working for the team and being a reliable rider to help the winners," said Rowe. "Obviously he's won races, but I think he can turn into a prolific winner himself and not always been the rider that's supporting other riders." Aside from the success on his bike over the season, Rowe says Thomas deserved the BBC award for his personality. "Throughout the years he's always been a winner, but as a person he's always been himself," said Rowe. "He's always kept his feet on the ground and he's never let the success overcome the nice and genuine person he is. "He's always got a trick up his sleeve and is always on for a bit of banter. "I think it's the perfect award for him."